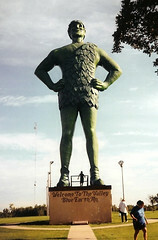 On our way to Minneapolis we passed through Blue Earth, Minnesota, home to the Jolly Green Giant. This is a MUST-SEE Roadside attraction! We pulled into town, picked up some trusty brochures at the hotel and discovered "A Taste of Minnesota." It was to be a grand bash on the lawn of the capital. So of course, we had to be in on it. It was like a carnival had been plunked on the side streets around the capital with overpriced food and games that had to be purchased with mysterious green tickets. I decided I wanted all the food I ate to be on a stick (I mean, it's good to set goals, even on vacation). Luckily (since I have an aversion to hot dogs) I found "Pizza on a stick". . . weird but a taste sensation. Imagine biting into a thick, cheesy piece of pizza and chomping into a pointy, wooden stick. . . pure eating enjoyment. We lay lazily in the grass with the gold dome of the capital building and perfect blue sky high above our heads. The craziest thing about the weather on this trip. . . everywhere we went, people said, "the weather was so crappy until you got here. . ." We had perfect days. I'm convinced that we have special "weather karma." So we spent the 4th of July with most of the population of the Twin Cities. Not bad. . . you betcha.